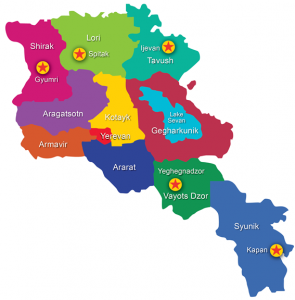 Armenian EyeCare Project » Luther J. Khachigian Funds Gyumri Clinic! Luther J. Khachigian Funds Gyumri Clinic! That has been the 81-year-old businessman’s mantra for as long as he can remember — and it’s more applicable now than ever. Khachigian, a longtime supporter of the Armenian EyeCare Project, has underwritten our fourth Regional Eye Clinic in Gyumri! The clinic is part of our organization’s biggest program ever to fight blindness in Armenia — Five-for-Five — the development of five Regional Eye Clinics in Armenia for $5 million by 2020. The Regional Clinics will provide access to eye care for the two million Armenians who live outside the country’s capital of Yerevan and find it too difficult and too expensive to travel to Yerevan for eye care. “When I heard about the Five-for-Five campaign I knew I was going to help in some way and that I would probably sponsor a region,” said Khachigian, who was born and raised in Visalia, California. Khachigian founded one of California’s leading grape and walnut nurseries, Cal Western Nurseries, and has sold over 150 million plants in his career. He now lives in Cayucos. The clinic Khachigian is sponsoring will be called the John Ohannes Khachigian AECP Regional Eye Clinic, named after his father, whom he loved and respected very much. “I adored my father and he was my hero in many ways,” Khachigian said. 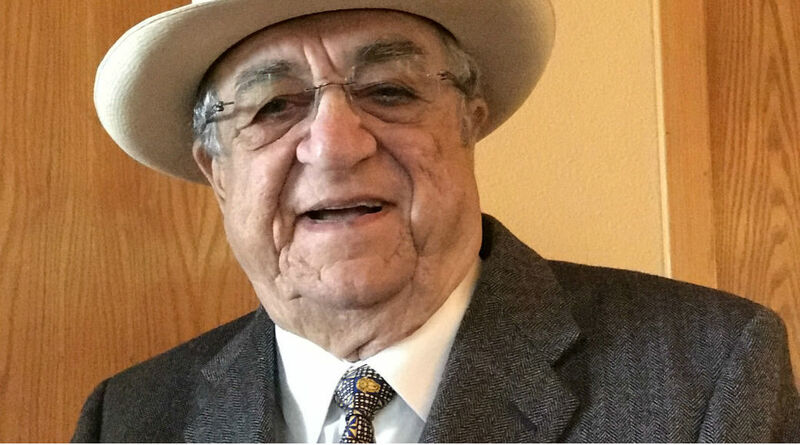 An Armenian Genocide survivor, John Khachigian fled Turkey with his mother and brother and ultimately settled in Central California, making a living as a farmer. The John Ohannes Khachigian AECP Regional Eye Clinic will be the EyeCare Project’s fourth Regional Eye Clinic in Armenia. The Haig Boyadjian AECP Regional Eye Clinic in Ijevan and the John and Hasmik Mgrdichian AECP Regional Eye Clinic in Spitak were opened in 2015 and 2016, respectively. The Regional Eye Clinic in Kapan will have its grand opening during the EyeCare Project’s 25th Anniversary Mission to Armenia in July. 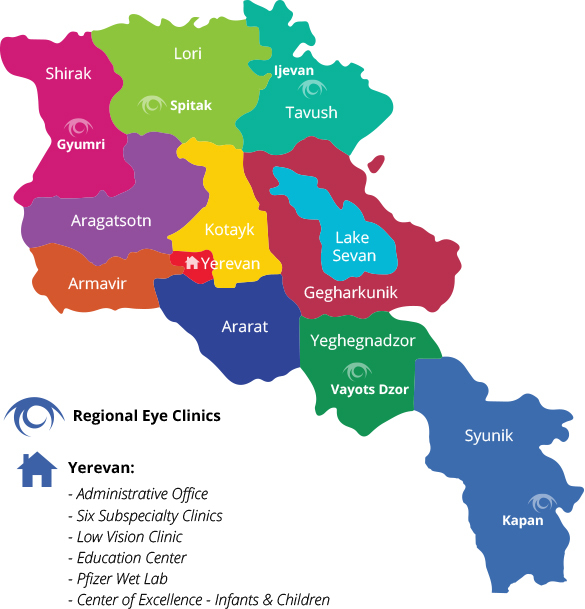 All five locations for the clinics — Ijevan in the Tavush province; Spitak in the Lori province; Kapan in the Syunik province; Gyumri in the Shirak province; and Yeghegnadzor in the Vayots Dzor province — were carefully selected by the Ministry of Health based on local need and the availability of eye care. The goal of the Regional Eye Clinic System, which aligns with the EyeCare Project’s mission, is to provide access to quality, affordable eye care for all Armenians. As for why Khachigian decided on Gyumri as the clinic location he wanted to support, he was out to lunch one day with his brother, Ken Khachigian, and good friend Aram Bassenian when Bassenian, a long-time EyeCare Project supporter, mentioned that his father was from Gyumri. Khachigian’s interest in eye care began at an early age when he happened upon a book about Helen Keller, a renowned author who was deaf and blind. Khachigian, convinced he would become blind one day, became intensely interested in the subject. Diagnosed with glaucoma by age 30 — an eye disease that can lead to blindness — Khachigian has been treated for the eye disease ever since. So when Khachigian first learned of the EyeCare Project several years ago he didn’t deem it a coincidence. He had decided long ago that the primary cause he would support would be eye care. This is not the first time Khachigian has been passionate about supporting the EyeCare Project. In addition to his extraordinarily generous monetary contribution to the Gyumri Clinic, Khachigian also underwrote the cost of three RetCams for the EyeCare Project’s Center of Excellence. These valuable pieces of medical equipment have been integral in identifying Retinopathy of Prematurity, a debilitating eye disease that causes blindness in premature infants in Armenia. “When I see photos of these little kids in Armenia with their big beautiful brown eyes it puts tears in my eyes,” Khachigian said when asked why he continues to support the AECP. Thanks to Khachigian’s extremely generous donation and recent sponsorship of the Regional Eye Clinic in Gyumri, the EyeCare Project is on track to reach our goal of developing five Regional Eye Clinics in Armenia by 2020 — with just one more Regional Eye Clinic in need of sponsorship in Yeghagnadzor, Vayots Dzor. If you would like to support our Five-for-Five campaign, please contact us or donate today. There are several naming opportunities for donors, including the entire clinic, an operating room, an examination room, or a piece of equipment.